Hi everyone! As you have probably gathered by now, I'm a little obsessed with creating outfits! Whether it's a lust list or simply what pay-day treats I'd like, I love it. When I heard about Moneysupermarket's competition in which you have to create 3 outfits, I jumped at the chance! 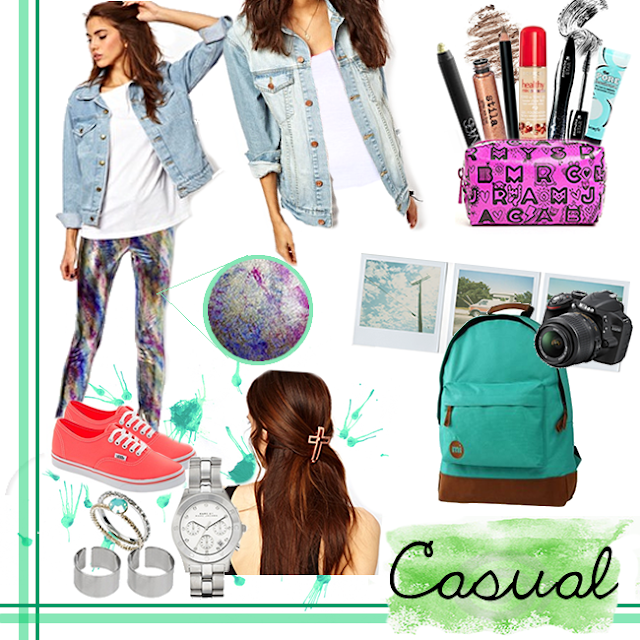 For the competition, you have to devise an outfit under the categories of: Party, Holiday/Beach and Casual. What's more, each has to total under £200. I'll have to admit - it is extremely hard to stay within a budget when creating outfits! It is so easy to get carried away with a plethora of goodies at your disposal! Judging each category are some lovely bloggers - Olivia for party, Jen for casual, and Natasha for beach/holiday. For more information on how to enter, click here. Below are my entries, hope you love them! I had so much fun creating them, and hope that channels to you! I've had my eye on this gorgeous ASOS dress for months now - encompassing key trends such as skater style and embellished collars, this number is sure to impress on the dance floor. I paired it with the focal point of my outfit: electric-blue accented accessories. These include the lovely Karen Millen embroidered heels and stylishly simplistic Zara clutch, for an eye catching look. My makeup would remain simple, ensuring it doesn't overpower my look. I am desperate to try the dot effect eyeliner by Illamasqua, and would pair it with soft bronze eye shadow tones. A quick sweep of my signature red lippy and I'm ready to go! This outfit made me lust for summer SO bad! For me, summer is all about the beach, wavy hair and glowing bronze skin. Mis-matched bikinis are also a must - they allow you to unleash your creative side and stand out from the crowd, while of course working on your tan! I chose this top from River Island for its adorable 3D effect finish, and the dotty bottoms for the perfect contrast. Who doesn't love a little nautical accent in the summer?! When it's time to head home for a barbecue, I would throw on the backless cami from ASOS and my favourite Mango shorts for an edgy, yet laid back look. I love the "backless" detail of the top, and can see myself living in it all summer long! My must-have accessories include a big floppy hat, for relaxing on the beach with a good book, and of course a pair of sunnies and plenty of bracelets! For me, casual is all about leggings and a baggy top. I love nothing more than spending my (very rare!) days off relaxing around the house, and these are essential for being comfortable while doing so. I was drawn to the leggings for their mix of exotic colours and metallic finish, which is pretty damn cool, right? If I (god forbid) have to leave the house, I would complete the look with my oversized denim jacket and trusty vans. I love to take lots of photographs when I'm out and about, so my trusty camera would be slung in to my backpack, ready for the perfect opportunity! I hope you enjoyed my entries as much as I did creating them! A massive thank you to Moneysupermarket for another fantastic competition! Good luck if you decide to enter. Superb picks of dresses and designer footwear.. loved it..